Running with SD Mom: A 4th of July PR, Hot Races and a #GIVEAWAY! I knew I had to do the Scripps Old Pros 10K again this year. Last year, I did the 10K in a pink and black tutu. Not very patriotic so this year, Red, White and Blue, Baby! Thanks to my good friend Elizabeth at A&E Custom Tutus, I had the right tutu. If you give me a tutu to run a race, you will have to give me a good friend to go with it and so Julie agreed to pace me to a PR! How rad is she?! In a matching tutu! I love this race because it is local and I always run into many friends! Best of all, this was the first race ever for SD Dad. He did the 28 mile bike ride! So we had to get a family picture. Also pictured is A, our sweet niece from MN out visiting. Oh and did I mention D did the 2 mile fun run with her? Then we split off...D & A off to the 2 miler, SD Dad off to the bike start line and me & Julie off to the 10K start line. At the start line, we ran into some of our San Diego Mom's Run this Town pals! That is always so much fun! My goal was the beat my Iron Girl Del Mar 10K PR of 1:00:39. I want a sub-1 hour so badly. Alas, with the heat and my not yet 100% hip, this was not to be. At least I got my course PR. 1:04:02. Better than last year by 3 minutes. 10:18 pace. And bless Julie's heart, she did her best to keep me talking and I won't lie when I tell you she literally had to push my back!! And then we were done! Excuse the wet looking shirt! I used a cold towel after the race drenched in ice and it may have got my shirt all wet! I am not going to lie. There were parts of this race I HATED! Especially the heat! I like to run at 5:30 a.m. Not 7:30 a.m. when it is HOT HOT HOT! I recommend two things for hot races. 1. HYDRATE and 2. SUNSCREEN! The first part is easy. Drink a lot of water in the week leading up to a race. Don't try to catch up on hydration the day before a race. Second, use sunscreen. 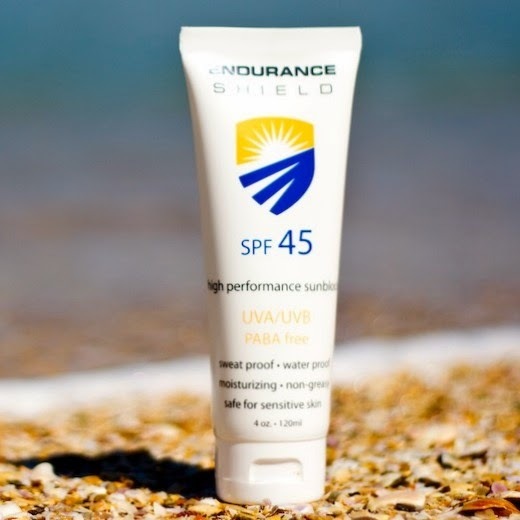 Use sunscreen like Endurance Shield which is waterproof, sweatproof, moisturizing, safe for sensitive skin, non-comedogenic, and that protects against UVA & UVB. As a side benefit, it smells FANTASTIC! Like honeydew melon but not sickly sweet! Endurance Shield is made and designed by a triathlete couple! and the souvenir chips (in the past, we have had to return them AS SOON AS we crossed the finish)! As soon as we got to the car though, my right calf cramped horribly and 3 hours later, the ache is gone. Probably what helped were my 4th of July Crazy Compression socks and my Endurance Shield Muscle Relief and Repair! 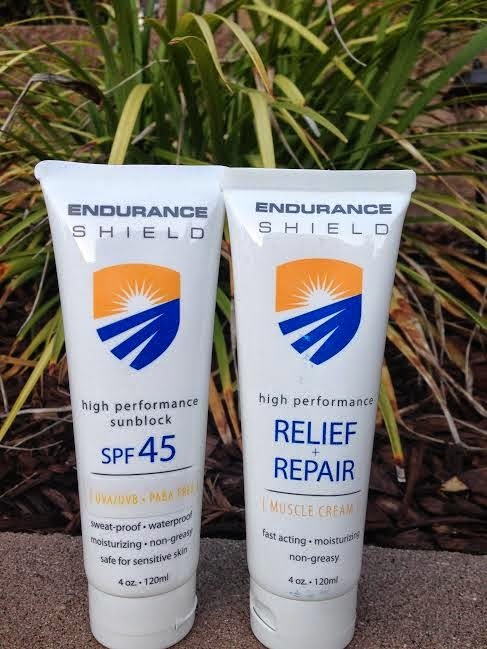 Now, in true SD Mom fashion, I am giving one of you a chance to win the Sunscreen and Muscle RR from Endurance Shield. I have used the sunscreen on my whole family and it works. No burning at all! And after my calf cramp today, I can tell you the muscle cream works too. No stinky Ben Gay smell! Disclosure: I was provided with one or more of these products to provide an honest review. I was not compensated for this post and all opinions are my own. 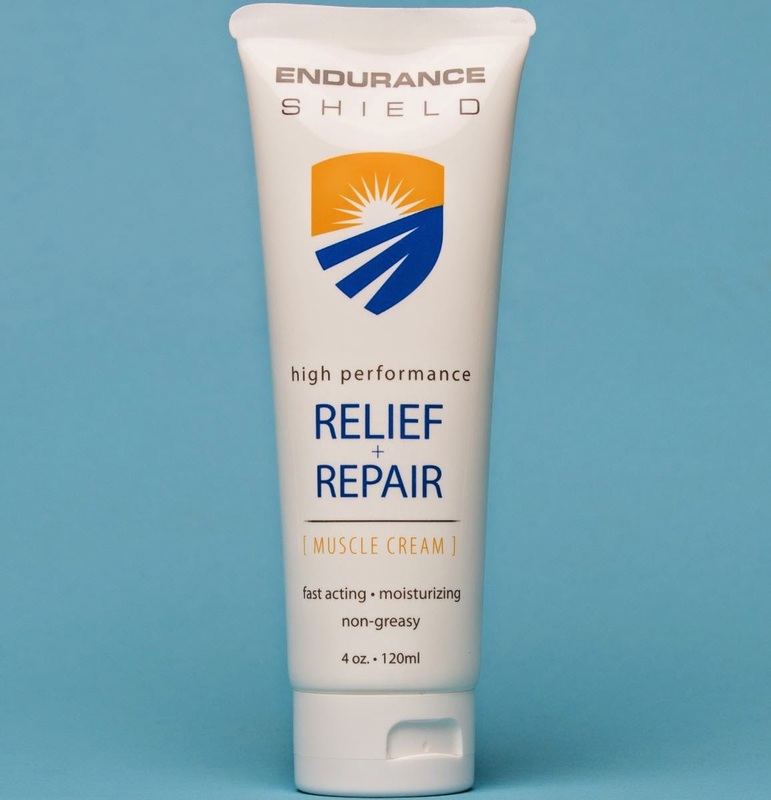 Winner will be provided the sunscreen and muscle cream directly thru Endurance Shield. Did you run a 4th of July race this year? Do you recommend it? What do you use for sun protection? Store brand at least SPF 50 sweat and waterproof. I love your cute little outfit, so festive! You look great! I use the Water Babies sunscreen (or generic equivalent) that I buy for my kids. LOVE your outfit! I use the spray Banana Boat for now. I don't feel like it is enough coverage, so I would love to try this stuff out! right now I use a department store sunblock. You looked great! I did the Peachtree Road Race 10K and it's always so fun to dress up and see so many people you know on course! I'm also chasing the sub-hour 10K! I love your RWB outift! You look great! Supergoop is my favorite sunscreen right now! I agree with you- it is hot! I was just about to start reaching out on twitter for sunscreen recommendations. I know what works for me normally, but wanted to get opinions for running purposes. I usually run early, but with having a jogging stroller now, I know I wont always be running at 5:30 am, because my daughter will want to run, and wont (thankfully) get up that early naturally. I ran a 10k on the 4th and course PRed but not my overall PR Same here! And I did get sunburn..tsk tsk on me for forgetting sunscreen!!! I use Neutrogena sunscreen right now. I would love to try Endurance Shield which is waterproof, sweatproof, moisturizing, safe for sensitive skin, non-comedogenic, and that protects against UVA & UVB. I like Ocean Potion. It has a great smell! What amazing giveaways this week!! I don't use anything for sun protection currently and that's probably a bad thing...I need to win this! haha. I tried looking for your amazing blue and white star compression sleeves. No luck! Help?